The mother of all monster movies, 1931's Frankenstein starring Boris Karloff as the title character's creation, remains an enduring classic. Forty-four at the time, Karloff had been acting for twelve years before he became a household name playing the creature in this adaptation of Mary Shelley's novel. Gay British Director James Whale helmed the project, one of several horror flicks he presided over, including Bride of Frankenstein (1935) and The Invisible Man (1933). But it is Frankenstein that many people over the years have come to see as a metaphor for his own persecution. Filmed some two decades before by Thomas Edison's film company, this remains the quintessential version. Karloff's performance and make-up became the definitive way the Monster would be portrayed for decades. Colin Clive played the obsessed scientist Dr. Frankenstein...who decides to develop a life by putting together parts of dead people. Unfortunately, the good doctor inadvertently gives his creation the brain of a criminal - which then drives it to kill. The Monster's downfall begins when he sees a little girl tossing flowers in a lake...and picks her up and throws her in the water, thereby drowing her. (This scene was left on the cutting room floor but subsequently added.) When the townspeople discover the child's death, they begin an earnest search for the creature. They find him and he is imprisoned, while the locals taunt and threaten him. The Monster manages to escape and makes his way to a windmill - with everyone in tow. Dr. Frankenstein shows up and tries to save him but the Monster throws him off from the top of the structure. The community is screaming for blood and they set fire to the windmill...with the anguished Monster supposedly perishing. The atmosphere created by James Whale on Frankenstein is masterful. 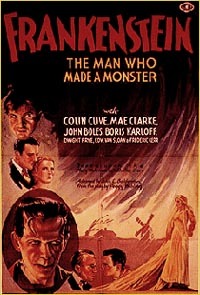 The Monster is a tragic figure and as portrayed by Karloff, extremely sympathetic. It's an indelible and wonderful, childlike performance. This film includes the doctor's immortal "It's alive!" line. In the original cut, the doctor continues, "Now I know what it's like to be God!" Censors made sure that particular sentiment was taken out.